Detectives request media and public's assistance in identifying additional victims in child molestation case. Vo is a heating/air conditioner repairman and plumber. 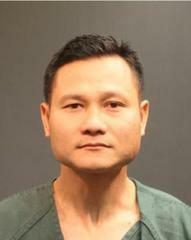 In both the 2011 and 2013 incidents, Vo entered the victim’s home after he was hired to perform repairs. Once inside the home, Vo was able to find an opportunity to be alone with the victims. The Santa Ana Police Department is requesting members of the public to call detectives if they suspect Vo had inappropriate contact or access to children. Vo has advertised in the Nguoi Viet newspaper in the past, using “Joseph’s Plumbing Heating and A/C Repair,” but may have received much of his business by referral. In 2013, Vo drove a white mini-van and is currently driving a white Toyota Prius. Please call Santa Ana Police Detectives at (714) 245-8351 to report inappropriate contact with Vo or if Vo had access to children.